And the winner is (drumroll, please) … Cerner, Leidos and Accenture. 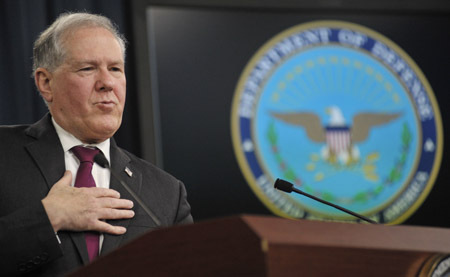 The contract's initial piece, valued at $4.3 billion, calls for the team to provide "an electronic health record off-the-shelf solution, integration activities and deployment across the Military Health System," a DoD spokesperson told Healthcare IT News. DoD's choice, in the end, came down to three teams: Epic Systems and IBM; Cerner, Leidos and Accenture; and Allscripts aligned with Computer Sciences Corp. and Hewlett-Packard. "Market share was not a consideration," said DoD Under Secretary for Acquisition, Technology and Logistics Frank Kendall. "We wanted minimum modifications." Being able to select a commercial-off-the-shelf software package and customize it as little as possible for a project this massive is the reason that DoD has given all along for not opting to use the U.S. Department of Veterans Affairs' proprietary and open source VistA EHR. "A commercial product gives us the opportunity to take advantage of private sector innovation," said Assistant Secretary of Defense for Health Affairs Jonathan Woodson, MD. He added that during the process of choosing a vendor, DoD officials visited with many health systems to learn how they transition from proprietary to commercial EHR systems. Part of DoD's requirement, in fact, was that the EHR interoperate with private sector systems since somewhere between 60 percent and 70 percent of care takes place outside the DoD. >"This is crucially important," said Woodson. "What we're doing today will help advance the public preparedness. The private sector is becoming more prepared, but we’ll accelerate that work." No, it's not the vendor who won. Rather, it's the adjusted overall price tag for the massive modernization project. Indeed, the figure is down nearly 20 percent. "We feel comfortable that we made a good source selection," Kendall explained. "Costs are coming in lower than our estimates." "We think it will be below $9 billion" over the long haul, Kendall added. "Competition has worked for us." Woodson pointed to sunsetting existing systems as a major factor in lowering those costs. Indeed, Military Health System CIO David Bowen said in 2013 that "legacy systems are eating us alive in terms of support and maintenance," and consuming approximately 95 percent of the IT budget. Whether the competition that drove prices downward will also translate to a shorter implementation time remains to be seen, but Kendall said DoD intends to first deploy the software at eight sites in the Pacific Northwest by end of calendar year 2016 – and the current plan is to have it installed at approximately 1,000 sites by 2022, though Kendall said once the contract is awarded they "hope we can go much quicker than that." "Today is just the beginning, now the hard part is going to start," said Chris Miller, program executive officer, DoD Healthcare Management Systems Modernization and Integrated Electronic Health Records. "Our focus now is shifting to testing. You're going to see an incredible test regime, digging deep into security, workflow, comprehensively testing the product to make sure it's ready to go before we deploy it."